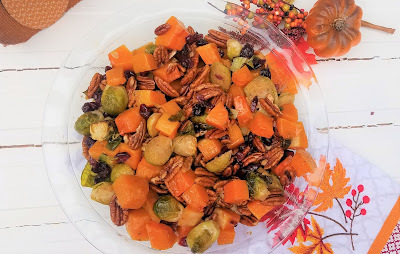 Roasted Brussels Sprouts, Butternut Squash with Pecans and Cranberries, with a Maple Glaze just screams fall. It also just screams Holiday Side Dish! Perfect for Thanksgiving or Christmas! It can be a challenge to find something new and exciting to serve that everyone loves and you feel good about serving. This dish is one of those dishes that is not only pretty to serve, with it's vibrant colors of green, orange and red, it also has a lovely fresh taste. This is one of my favorite dishes. I first discovered it the recipe here, and knew instantly that I would be making this and loving it. I was right. the roasted veggies lightly tossed in a maple glaze, and mixed with a the crunch of toasted Pecans, and the sweetness of dried cranberries. It's just the perfect blend! In a medium bowl, combine cubed butternut squash (peeled and seeded) and Brussels sprouts ,2 tablespoon of olive oil, maple syrup, and toss to mix. Spread mixture onto baking sheet into single layer. Bake 20-25 minutes till tender, turning once halfway thru. 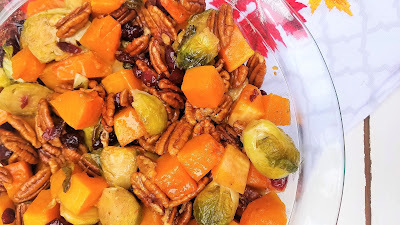 In a large bowl, combine roasted Brussels sprouts, roasted butternut squash, pecans, and cranberries. mix to combine. If you'd like more sweetness, add 2 or 4 tablespoons of maple syrup, if desired – a tablespoon at a time to desired taste, mixing as you add add it.